One of the most wonderful things you get to explain to a child is how special he/she/they is and how unique. The old snowflake situation, no two alike, describes perfectly how we humans come into this world. Diversity is a great gift. With all the points of view and ideas about things, we get a tremendous 360 look at any problem or possibility. It's a gorgeous, hopeful thing this diversity. This book is a brilliant..and I do mean brilliant example of how diversity looks in action. Hey, if they asked you what your favorite bug is and then said, "Draw me a picture of it," what would you bring to the table? Markers? Watercolors? A well-sharpened pencil? This book does exactly that. Fifteen people who really know how to draw and who create very different styles of art sat down and thought about their bug. What would they choose? Then, how would they draw the little bugger? With each turn of the page a whole new way of seeing the world appears before us. Some draw a tight bug and some send their bug out to light up the night. Bugs turn out to be treasures. If ever you have a class that struggles with differences or thinks one way is the only way, you are now happily armed with the most powerful evidence that our diversity is our best. *********** In this companion to What's Your Favorite Animal? 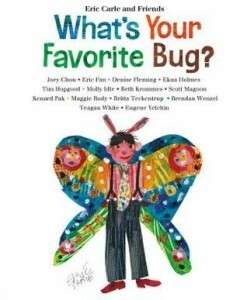 and What’s Your Favorite Color?, Eric Carle and fourteen other beloved children's book artists illustrate their favorite bugs and explain why they love them.